Gay does have another meaning, not to make a big thing of it. And spring is the time for gay clothes, pieces that seek the sun, ever warmer and more insistent on the back. Here are some lighthearted delights on my wish list this spring. 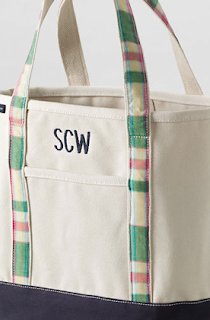 Just one item would lift my heart. 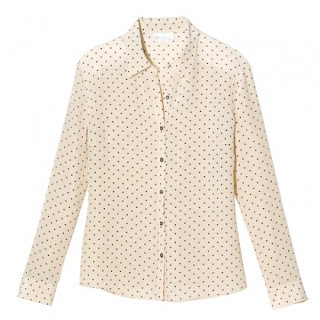 Eric Bompard's silk polka-dot shirt (E95) will be perfect with navy pants, my denim pencil skirt, or even jeans. Pretty and polite; if you have good legs, wear it with shorts. Keds. 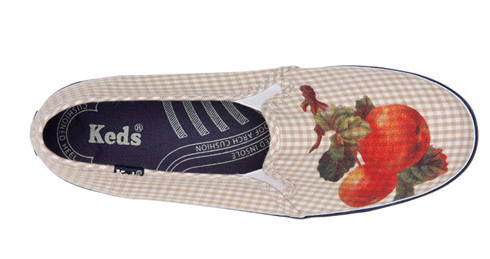 Gingham with fruit. Because the bohemian side loves a sunny summer day, when maybe you do not much of anything. (I tried them on; they run wide, and I'm a standard B.) Price, $45. Gay, jaunty, chic; Stella's insouciance is MacCostly, but if I had a plump piggy-bank, I'd spring for it. 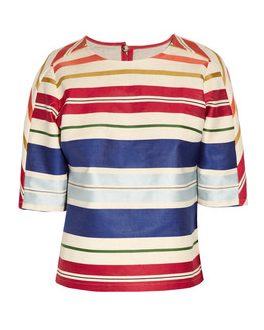 (Deck-chair striped top, $1,165 from net-a-porter). 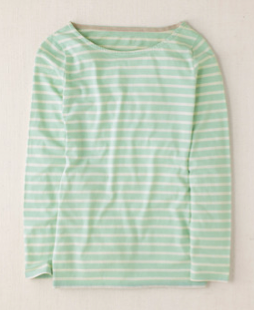 Boden Breton stripe top, in mint, £25. Or candy pink, or lilac, the fun colours. Jaunty in navy, too, but the ice-cream shades promise more hijinks. Madras: An inherently happy fabric, not easy to wear unless you're quite thin, but anyone can carry a bag with a retro stripe. Price, $40 from Land's End. Red shoes make you skip! First, a pair for touring, with padded insoles and an anatomic footbed: Acropedio's cherry "Rose" flats, $139 from Zappos. 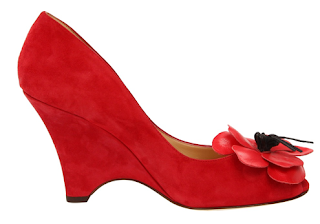 Then, a flirty pair for dancing, Kate Spade's "Caelyn" suede wedge; price, $325 at Zappo's. Poppy on the toe, Prosecco at hand. Our mothers understood: You kept that coat, you bought a fabulous new hat. Straw will strut soon as buds push forth. I covet Albertus Swanpoel's fedoras; his Cape Cod model is $380 at Barney's. 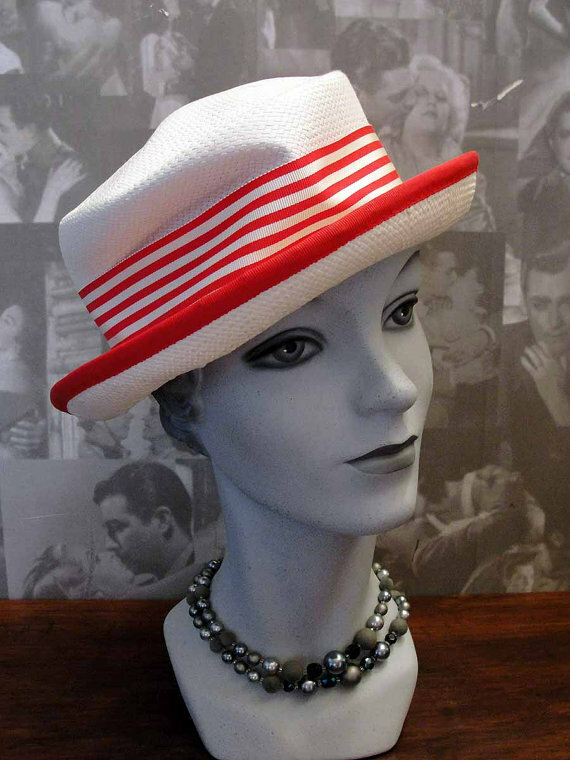 Frugal but flaunty: A vintage panama in a merry red stripe, size Medium, a mere $24 from etsy seller Hoogs. Imagine with your jeans, a light sweater, and spring in your step. What will you bring out or buy? What lifts your heart, makes you yearn for tulips, find the first outdoor terrace, venture a sockless shoe? 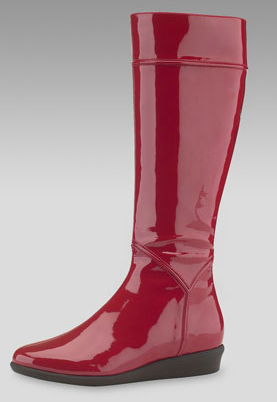 There is always one thing that shouts spring, and we'll let it, even if a pair of rain boots. The one new thing I want each spring is a white shirt of some sort. This year I found one that is semi sheer with a kind of white on white stripe. I do like that Breton tee tho. I've already started to wear lighter washed jeans and white shirts. No sock with my shoes. Lovely. Ah, if only I had a "hat head." love that first one you've shown! I have not put away my winter clothes and am dreaming of floaty linens. Red shoes are a mood shifter for sure. Hats are difficult for me to wear but I have a few straw ones for gardening and the boat. "Gaiety"--a grand old word. What is it about the predictable intervals in repetitive patterns like dots, stripes, checks and plaids that is so refreshing to the eye? I love them all--and red shoes and straw hats, too. A few weeks ago while thrift-shop browsing, I found a cheerful, well constructed, and strangely flattering cotton shift with its original tags from a Cape Cod shop. A dress I might have worn in high school, it's not just madras--it's patchwork madras. As Erma Bombeck once said of a recipe for orange cake with orange icing, "Earrings for an elephant, and no apology!" Darla: That sounds ike an interesting shirt! Fresh white for spring, so appealing. kathy peck: Going wihtout socks is one of life's small pleasures! Love that Stella McCartney top -- which would completely overwhelm me, in reality. But still, it's swoon-worthy. 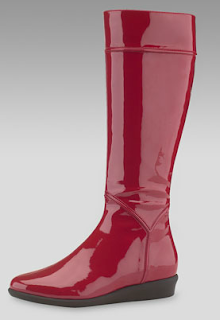 Love those rain boots as well, and patent leather, perfection! Have to echo Hostess, though -- I keep trying to put away my winter clothes, but then have to haul pieces back out again because of the continued damp chill. One of these days . . .
What I'm seeking is far more practical - a well-cut jeans jacket, for a curvy shape. (Not Levi's). I adore that mint tee. I'd like that one please. materfamilias: Her entire spring collection is a knockout, even just to window-admire. lagatta: Have you condsidered this? It has seaming for shape and adjustable tabs at the side. Debbi: Those offbeat colours in marinieres are so much fun! C.: Wonder how well-made it will be? Land's End have definitely gotten more stylish but- please let us know. The reviews were pretty good. Lovely! I especially like the marinieres and the first blouse. But the hats....I am trying to wear hats, although I'm not sure I look good in them ,because I'm getting my face lasered next week & need to be especially careful about sun exposure. But I have a big punkin head (23 1/2 inches!). And womens' one-size-fits-all totally does not fit me. I can wear mens' size large, but the styles are less than exciting. Any suggestions? Lovely colors! The Keds are wonderful. I've been wavering about that pink-striped Breton -- I think you may have pushed me over the edge! http://www.hatsscarvesandmore.com/c-large-size-hats.html and a search on "large size hats for women" will turn up more. 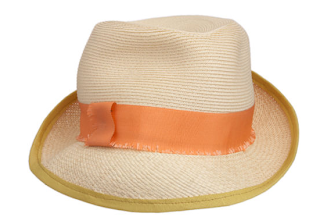 Even if we are not natural hat-wearers there are times when a brimmed hat is essential. Another word would be cheery:). I could imagine wearing a hat and those Kate Spade wedges. Imaginary dressing is so much fun - I really enjoyed this post. It's lovely to feel light-hearted. LPC: Or merry? Of course today is raining sideways sheets so it would all stay in the closet till the sun shines. Jacinta: It's not just her size and age, it's her style we should consider. I would not expect pearls given at 16 to be "forever" (though might someday be mixed into another strand) nor did you give me a budget, but I like the Pearl Princess- it's hip and definitely not boring. I also like the "5 South Sea Pearls on Black Cord". You'll want, I'd think, something she can wear easily, not just for dress-up- so how about a pendant? It's lighter and a young look. See "White Drop Pearl Wish Necklace". If you have your heart set on a strand, talk to Sarah, Kojima's owner. She does a lot of craft shows and can tell you what the young women like. She also has more pearls than are on the site and will send photos. Jacinta: Reconsidering what I said about Cardellini's site... there may be the perfect pearls there but I'd ask her to string them on PowerPro (a type of thread)with knots, and not with little gold spacers in between as she likes to do. Such temptingly pretty things. I've drooled over Stella McCartney's but alas, drooling is all my budget will allow. The boden top in pink, or even lilac, is a temptation however. Duchesse, the Stella Mac is a dress and it has come out to play. It has proven to be an incredibly versatile piece that I wear often, which only goes to confirm that one should buy what one loves. Now if I just had last year's budget this year, but one manages anyway.